After what appeared to be a costly misfire, the Trump administration appears ready to release a revised executive order on immigration after massaging the language through the traditional interagency process it skipped the first time around. It shouldn't come as a shock that the order still applies to the same seven countries: Iran, Iraq, Syria, Yemen, Somalia, Sudan, and Libya. The main difference is that those who are green-card holders or dual citizens of the U.S. and the targeted countries will be allowed to travel freely in and out of the United States. Additionally, U.S. authorities will no longer single out Syrian refugees when processing new visa applications and refugees citing religious persecution will not receive special consideration. Nevertheless, the new order follows the one it replaces in temporarily suspending new visas from certain troubling states. While terrorist-sponsoring states and organizations wishing to harm Americans may disproportionately come from the Middle East, they often rely on corrupt states and officials outside the region to finance their actions through a range of illicit activities. Lost in the highly politicized immigration debate is the nexus between America's adversaries, such as Iran and Hezbollah, and their shady terrorist-financing networks that span the globe. Those financial tentacles reach into South America and even the United States, pointing to the need for us to guard against would-be terrorists reaching the homeland, and the necessity to further rein in our adversaries by punishing their pocketbooks. To that end, several recent underreported stories may shed some needed light on the new administration's efforts in counterterrorism. Although many news reports focused on the botched rollout of the initial plan, the substance of the new policy did not come about in a vacuum. Rather, it appears to represent an element of President Trump's effort to push back on Iran, and its terrorist proxy, Hezbollah, as well as ISIS and other Sunni terror groups. 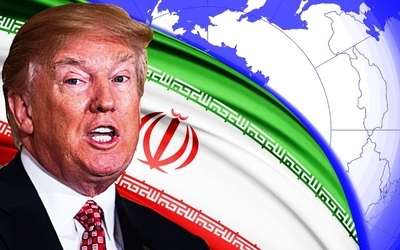 In addition to the executive order, the Treasury Department slapped fresh sanctions on 13 individuals and 12 entities involved in procurement activities for Iran's ballistic missile program and support for Iran's Islamic Revolutionary Guard Corps (IRGC) – Qods Force. White House officials described the measure as an "initial" step, indicating a more robust plan is being considered to confront the Islamic Republic's troubling activities left unaddressed in the nuclear deal. The seven countries singled out in Trump's executive order represent an updated appraisal of the threat matrix currently facing the U.S. from abroad. They are states where ISIS is predominantly active and failed states that serve as incubators for international terrorism. It should not be lost that Iran has been politically or militarily active in each of the six other states—from the civil wars in Iraq, Syria, and Yemen, to Somalia, Sudan, and even Libya, where the involvement of the IRGC-Qods Force in the 2012 Benghazi attack was discovered by former National Security Adviser Michael Flynn, who at the time was serving as director of the Defense Intelligence Agency. Also underreported was that the initial immigration order helped put a temporary damper on Iranian and Hezbollah financing. Indeed, its effects were felt in southern California, home to between 300,000 and 500,000 Iranian-Americans, according to a recent report. Farhad Besharati, who runs a travel agency in Westwood—an upscale Los Angeles neighborhood dubbed "Tehrangeles"—said that despite the outrage over Trump's actions, the travel restrictions could serve to disrupt Hezbollah's financial networks. Quoted in Lebanon's Naharnet, Besharati said, "There are rich people coming from Iran with millions or billions of dollars and they spend $500,000 and get a Green Card. These are not regular people who come for education or work. These are the people protecting Syria and Hezbollah." While paying for a green card inside the U.S. can come at a steep price, there are less expensive paths to procure documents that will allow entry at the borders. Sanctioned Venezuelan Vice President Tareck El Aissami. Take, for instance, the case of Venezuela and its new vice president, Tareck El Aissami, the subject of new Trump administration sanctions as an alleged drug trafficker. A yearlong investigation by CNN uncovered links between Tareck and 173 Venezuelan passports and IDs that were issued to individuals from the Middle East, including people connected to Hezbollah. According to a 2013 intelligence report obtained by CNN, El Aissami was in charge of "granting visas and nationalizing citizens from different countries, especially Syrians, Lebanese, Jordanians, Iranians and Iraqis." These activities took place from 2008 until 2012, when he was a minister in charge of immigration and a governor. The systemic corruption regarding forged or fraudulent documents isn't confined to Venezuela's borders. The investigation discovered that passports, visas, birth certificates, and other Venezuelan documents were sold for thousands of dollars out of their embassy in Baghdad, at least through 2014. Meanwhile, Ghazi Nasr Al-Din, a former Venezuelan diplomat who worked in the country's embassy in Syria is still wanted for questioning by the FBI for "his fundraising efforts" with Hezbollah contributors and for facilitating the travel of Hezbollah members to and from Venezuela. While a visa is required to enter the United States from Venezuela, their passport allows entry into over 130 countries without one, including 26 countries in the European Union. 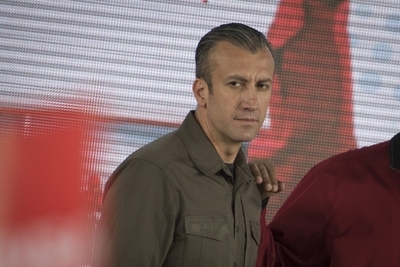 On February 13, the U.S. Treasury officials added Tareck El Aissami to its sanctions list after a lengthy investigation of his alleged links to drug traffickers and Muslim extremists. The measure blocks access to his estimated $3 billion fortune. According to the U.S. Treasury Department's Office of Foreign Assets Control (OFAC), "This case highlights our continued focus on narcotics traffickers and those who help launder their illicit proceeds through the United States," OFAC Acting Director John E. Smith added in a statement. Days after CNN published its investigative story, Venezuela pulled the plug on CNN en Español. A statement released by the National Telecommunications Commission said the channel's coverage represented "direct aggressions against the peace and democratic stability" of the country and "generated an environment of intolerance." All of this fits an established profile. According to a recent report by counterterrorism and intelligence specialist, Matthew Levitt, there has been an uptick in the activity of Hezbollah's foreign relations department, "whose members formally serve as liaisons to Shiite communities around the world but who have been increasingly employed in various criminal and terrorist activities." Canadian intelligence officials have reported similar activities. Indeed, Hezbollah's criminal enterprises span the globe. According to Levitt, "U.S. officials believe 'a substantial portion' of revenue raised by Middle Eastern terrorist groups in general comes from the $20 to $30 million brought in annually by the illicit scam industry in the United States alone." 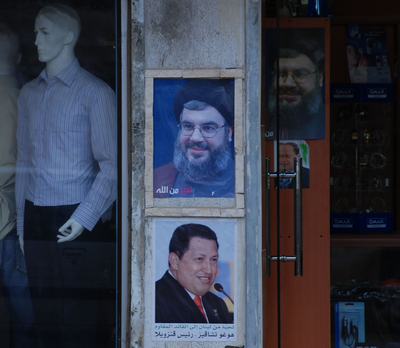 Whether from narcotics, used car sales, or setting up money laundering front companies, U.S. law enforcement now views Hezbollah-affiliated criminal operators as "super-facilitators" for a host of crimes and clients. At the heart of the Iranian-Hezbollah-South America nexus and Hezbollah's terrorist enterprise is Iran's clerical army, the IRGC. They are Iran's most important security, military, and political institution, with financial interests in most areas of the state's economy. Its Qods Force, which is in charge of global operations, was officially designated as a terrorist entity by the U.S. Treasury Department in 2007. Hezbollah was designated in 1997. The Trump administration appears to recognize that more work lies ahead. The recent announcement of additional sanctions on Iranian and Venezuelan individuals and entities represents a good start. Hundreds of other IRGC-associated operators and entities could be targeted as more pressure is warranted. Given the billions of dollars in sanctions relief that replenished Iran's coffers, restricting the IRGC and Hezbollah's financing of civil wars, terrorism, and illicit activities represents a sensible measure to check their global ambitions. Trump's immigration order targets failed states that serve as an incubator for terrorism or states where terrorists operate either freely or under the direction of those in power. Meanwhile, U.S. sanctions are increasingly targeting corrupt states and officials who illegally profit from their endeavors on a global scale. In the world of counterterrorism, all of these issues are interlinked. Whether the new immigration order fits that bill or not, one thing is for sure: A combination of vigilance at the border, careful screening for visas, and targeted sanctions by the U.S. Treasury Department are tools the Trump administration will need to use to push back against Iran and ISIS, combat terrorist financing, and drain the financial swamp where those who threaten the U.S. conduct illegal business.